Our 3 Way Large Linear Smooth Kerbs with their distinctive smooth texture are designed to match any of the paving ranges to achieve that perfect finish. 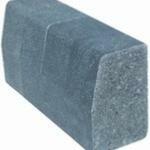 Adaptable for use in driveway edges, pathways, flowerbeds and in the construction of steps and other landscape features. They can be installed in 3 different orientations - bullnose, half battered or splay.